European Union and Chinese negotiators reached an agreement to curb EU imports of solar panels from China in exchange for exempting the shipments from punitive tariffs. The accord would set a minimum price for imports of the renewable-energy technology from China. In return, Chinese manufacturers would be spared EU levies meant to counter below-cost sales, a practice known as dumping. The EU import taxes target more than 100 Chinese companies including Yingli Green Energy Holding Co., Wuxi Suntech Power Co. and Changzhou Trina Solar Energy Co.
“We found an amicable solution in the EU-China solar-panels case that will lead to a new market equilibrium at sustainable prices,” European Trade Commissioner Karel De Gucht said in a statement yesterday in Brussels. He didn’t disclose China’s minimum-price offer, which must be accepted by the full European Commission, or indicate whether the accord includes a limit on the volume of imports from China. The goal is to limit Chinese competition against European manufacturers such as Solarworld AG (SWV) in the EU’s largest commercial dispute of its kind, without resorting to anti-dumping duties. The case covers EU imports of crystalline silicon photovoltaic modules or panels, and cells and wafers used in them — shipments valued at 21 billion euros ($28 billion) in 2011. The pledged price will allow Chinese companies to continue exports to the EU and “keep reasonable market share,” according to a statement yesterday on the website of the China New Energy Chamber of Commerce, which advises both the government and companies. In early June, the commission announced provisional anti-dumping duties as high as 67.9 percent on Chinese solar panels. The commission, the EU’s Brussels-based executive arm, decided to apply an initial lower rate of 11.8 percent for two months to encourage the government in Beijing to negotiate a solution. As of Aug. 6, unless the accord goes ahead, the provisional levies will range from 37.3 percent to 67.9 percent, depending on the Chinese company. The commission said that it can’t give further details on the price undertaking until it has formally approved the agreement. The accord would fix a minimum price of 56 euro cents a watt for annual imports from China of as much as 7 gigawatts, said a trade official in Europe who spoke on condition of anonymity because the information hasn’t been publicly announced yet. The pact would cover around 90 Chinese exporters that have about 60 percent of the EU solar-panel market, according to the official. The case highlights EU concerns about the expansion of Chinese solar companies, which have grabbed market share from European rivals that were once dominant, and underpins a broader crackdown by Europe on perceived unfair low pricing by China’s exporters. EU ProSun, which represents around 40 European solar-panel producers including Solarworld of Germany, called the deal unacceptable and vowed to file a lawsuit. The group said the agreed minimum price matches that at which Chinese exporters are selling solar panels in the EU and the volume cap represents about 70 percent of the “expected” solar market. In Europe, which accounts for about three-quarters of the global photovoltaic market, more than two dozen manufacturers have sought protection from creditors since 2010 and many have shifted production to lower-cost plants in Asia. Germany’s Q-Cells SE, which was acquired last year by South Korea’s Hanwha Group, has its largest factory in Malaysia. 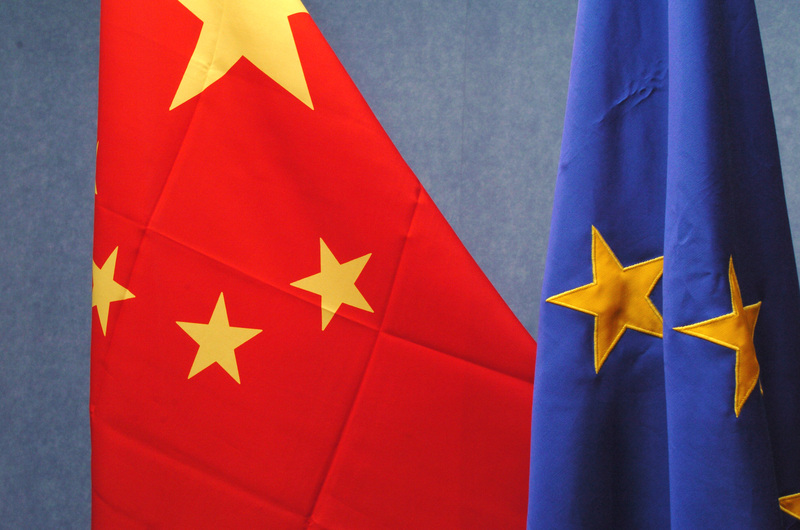 Chinese exporters increased their combined share of the EU modules market to 80 percent in the 12 months through June 2012 from 63 percent in 2009, the commission said in June, when introducing the provisional anti-dumping duties. The Chinese industry expanded its share of the bloc’s cells market to 25 percent from 8 percent and of Europe’s wafers market to 33 percent from 6 percent over the period, according to the commission. The duties were the preliminary outcome of a dumping inquiry that the commission opened in September last year and that German Chancellor Angela Merkel said in May shouldn’t lead to permanent levies against China. EU governments, acting on a commission proposal, have until Dec. 6 to decide whether to accept the draft agreement as a definitive measure. Such arrangements usually last for a period of five years. The EU is also threatening to impose a separate set of duties on Chinese solar panels to counter alleged subsidies. That’s the focus of a second investigation in which the deadline for introducing any provisional anti-subsidy duties is Aug. 8 and for imposing any definitive measures is early December.